There's a new, not-so-little book out these days. 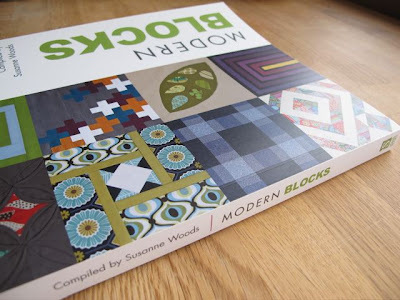 Modern Blocks: 99 Blocks from Your Favorite Designers is full of incredible block designs. Some seem simple and even a bit more traditional, others are so phenomenally unique and representative of modern quilt design. All are pretty cool. This book is going to be a well used resource in my library. Yes, even for me, a girl who doesn't like to follow patterns. There is just so much inspiration in here. Oh, and I'm one of those favorite/favourite designers. See, that's my name on the back of the book there. 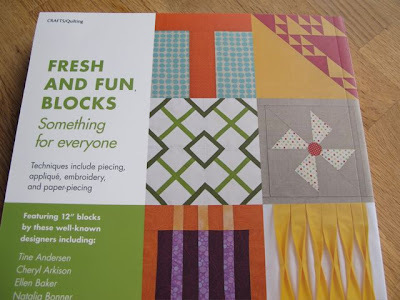 And that orange and turquoise T block there is one of two of mine in the book. Later this week I'm going to share a quilt top I made using that block, but for now I want to offer the chance to win one of these books. All I ask is that you leave a comment below telling me how long you've been quilting and how you learned to quilt. That's it. If you are hoping to win the book for someone else, then tell me about them or a fun fact about you. Just make sure you have an email attached to the comment so I can get a hold of the winner. International entries welcome. Entries open until December 1, 9:30 am MST. Ive been quilting since 1991. I took a 10 year break in 1999. I learned to quilt on an internet listserv quilt guild called Quiltnet, using emails and asqii drawings. I made my first quilt in 1994 using one of the Quilt In A Day books! It wasn't pre-internet, but back then, there definitely weren't any awesome blogs about learning to quilt! I have been quilting since the early 80's. I have loved sewing since I was in public school. I have taken classes and workshops over the years and love to challenge myself with a new technique with each quilt I make. Ive been sewing for 4 years, I have made 2 quilted runners and 1 doll quilt. I'd love to see the book and get the guts to make a full size quilt. I wouldn't had learned without blogs, tutorials, and the internet. I took a class back in 1991 at the old Father Lacombe center in Millrise (now St. Mary's University). Also took a class with a mom's group at the United church on Elbow Dr. Rose was the instructor, a nurse at Rockyview. She ended being my nurse with #3. I see her now and then at quilting shows. I have taken breaks over the years depending on what life was dishing up, ie having 3 kids, moving over seas & back etc. Looks like a great book, congrats on the 2 blocks. I've been sewing since I was little--handmade some clothes for my Barbie doll--and then did a lot of garment sewing through high school, college and the early days of our marriage. But I've been quilting since the mid 1990s. After trying nearly every craft option available, I realized what a big part quilting played in my heritage. And one of my best friends taught me. Best thing I ever learned how to do! Very cool! I've been sewing off and on for probably 10 years, but I got into quitting about 2 years ago. I'm 100% online taught. I've been quilting for about 3 years, and i learned from books and the internet. I don't have a creative none in my body and need inspiration from others! I've been quilting about 12 years, and am more and more addicted to it every year. 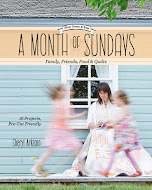 I'd love to win this book for my sister in law. She's my best buddy, and has started quilting a little 2 years ago. She's becoming more and more involved with quilting as she learns more. I think this book would be a fabulous resource for her to use. She just found out she's going to be a grandma, and her daughter loves modern quilts, so this would be perfect for some very fashionable baby quilts and accessories. Thank you for being part of this fabulous book and for giving away a copy! I've been quilting since August 2010, so a newbie. I've watched my mom quilt and sew all my life; I even tried before and was a flop. But last year, it just clicked and now, I'm a quilting junkie too!!! I've been quilting for just four years now. I started with a "learn to quilt/sampler" class at The Cloth Shop in Vancouver. My baby was 6mos at the time. She's four and a half now with a 4month old sister and the da*n sampler top is almost done. But I've made quite a few other quilts since starting the first one. I build skills by reading books/looking at pictures (thanks internet! ), hanging out/sewing with older ladies who quilt and asking questions of quilt shop employees. I haven't been quilting very long, and I am not consistent. My first quilt was a queen sized quilt, about 9 years ago, made out of scraps, and my mother-in-law taught me how to do it. Why queen sized? I didn't know better. And my mother-in-law couldn't talk me out of it. After all, how hard could it be? Ha! I made my first quilt when I was 15, so it's been off and on for 20 years. I love the graphic nature of modern quilting. Thanks for the chance at this lovely book. I've been quilting for about 5 years, I tiik a beginning class at a local quilt shop and never looked back! I feel relatively new to quilting (started in earnest in 2009, though I'd made a couple pretty bad quilts before then). I'm completely self-taught - starting with books from the library. Found the online quilting world and Portland Modern Quilt Guild soon after and definitely feel like I found "my people". Can't wait to see what you did with your "T" block! I have been quilting for 2 years. I have no tv and there is only so much reading you can do. I had always been interested in sewing, my mom is a killer sewist, and I had read someplace that a quilt is to be loved and rolled around in, not all quilts go to the county fair. So I hoped onto the internet and started looking at and reading blogs. Sewing for love, not a ribbon, is very liberating and motivating. I enjoy your quilting and cooking (and so do my kids). Thanks for the chance. I have been quilting for 4 years, but I was stuck until I found quilting blogs and the fire was ignited! This book is beautiful! I've been quilting since high school (about 12 years now). I always have several quilts in various stages of completion happening simultaneously--somehow, it helps me stay motivated! My aunt Tammy, who now runs a long-arm quilting business, taught me how to quilt little paper-pieced mug rugs. The next Christmas, I made a simple nine-patch quilt for my now-husband. I started quilting when I started having babies, back in 2001. Just learning as I go! I've been quilting exactly one year this month and I learned from my lovely mother in law, it has brought us closer together. I made my first quilt at ten, self-taught out of a book. It was small and wonky but my grandma loved it anyway. It was years before I tried another, again using a book. Now the online quilting community has helped me learn by leaps and bounds. Fun fact: My name is Carly but many people mistakenly call me Scarlet upon meeting me. Odd, yes, but it's happened so often that I've considered changing it Scarlet just for whimsy's sake. I've been quilting since mid 2009 and I have been in love with it since. I learned to quilt from one of CrazyMomQuilts tutorials, and it was amazing! (I knew how to sew already, but that blog opened a whole new world) it something I hope to do until the day I die! I started quilting last summer because of all the lovely blogs here on the internet. I have been sewing on and off for about 25 years, but after I discovered modern quilt in the summer off 2010 the sewingmachine has not stoped. Unfortunaly it is a hard time to get all the lovely fabrics here in scandinavia:(. I´m still learning to FMQ and using all the lovely tutorials from blogs and youtube. ec. I learned the binding teknic from Crazymoms tutorial. This is enought off my very bad written English - I hope to win this lovely book. I´ve been quilting since 1991, but not frequently unitl about 2006 when I bougth a new sewingmashine and have a different life than earlier. Selflearned by books and papers, since 2008 also by other quilters on the internet. Later also a few courses. I´ve just started to "teach" a friends 13 yearold to sew patchwork and the book would be a fantastic inspiration to both her and myself if I am the lucky winner. I have been quilting for a little over a year now, I had not much experience sewing but had always thought that quilts & quilting looked great. 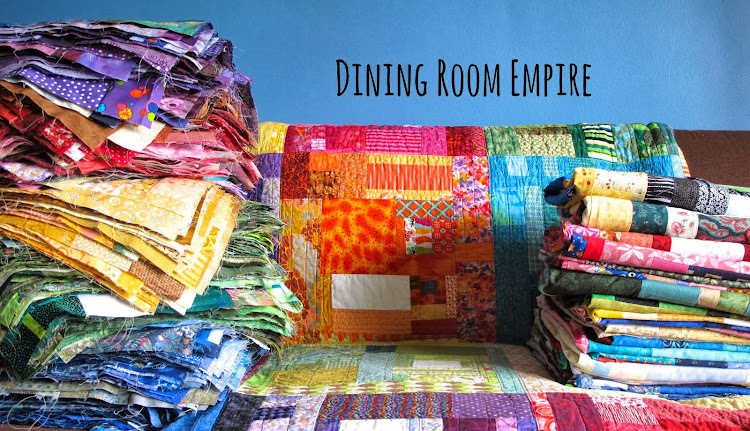 I then stumbled across modern quilting blogs & have been inspired & obsessed ever since. I'm so grateful to have blogs like yours to help me learn the skills necessary to help me on my quilting journey. I only started in March of this year. My Mother was an amazing seamstress and has been gone for seven years (last March). I was not lucky enough to have learned from her, so I am learning as I go. I bought a machine, a book (Dear Jane of all things) noone told me not to start there, but hey...I am always up for a challenge! I have 58 Jane blocks so far and did the QuiltUber Fest blocks here on line, and the top is all together ready for me to learn to quilt (aahhhhh)! I would love a chance to win more patterns! Thank you! I've been quilting for about 2 yrs now. I learned by taking a class at my LQS. I've been sewing since I was about 10 though! I started quilting in the summer of 2003 when I was home from university. I made my first quilt from a description on a livejournal blog (not about quilting) and took my first class three quilts later the following spring. I still love the social aspect of tAking classes, and make it to my LQS's UFO pizza party most months. Congrats on being in this book! It looks like it's chock full of inspiring blocks. I started quilting in 2009 when my youngest son went to college (sniff, sniff) and I needed a hobby to combat my empty nest syndrome. Well ... I found it! I've been learning and growing in quilting since then and look forward to expanding my skills. I think I get a little better and learn a little more with each quilt I complete. I started seriously in oct 2008 when I got myself a Bernina 440QE which bundled with a free lesson and I made a king size logcabin quilt. Wow, that book looks inspirational and amazing! I would love to have it in my personal library. I started quilting when I was 8 - when I cut up all my socks to make a quilt a la Laura Ingalls Wilder. That didn't work out. :-) I started seriously quilting a couple of years ago and pretty much taught myself. Now, I'm a big fan of youtube and blogs like yours! I have been quilting for about 2 years. I watched my grandma do it for many years, and I finally took a class a couple of years ago! Thanks. I've been quilting almost 3 years and learned from books and websites. I started quilting last winter, right after erring a sewing machine for Christmas. Found a tutorial/quilt-along online, and followed along there. I love it, and love the ideas in the book! I made a couple of quilts about 14 years ago, but had my daughter and no time to really delve into it deeply. Two years ago, I really entered into the time I would actually call myself a quilter. I've learned mostly from the intertubes and pushing myself, though I did take one class on free motion quilting. Hi Cheryl, I started quilting six years ago when I was weeks postpartum. Good friends who quilted invited me to join a Halloween quilt block exchange and I was too out of it to say no. I have not looked back since and couldn't imagine life without a quilt (or two or three or ... more) in the works. I learned how to quilt in 1976 when I was 14 years old. I wasn't a sporty kid and my mom didn't know what to do with me, so when I said I was interested in sewing, she signed me up for a class. I have been quilting on and off for the last 36 years, mostly on for the last 25. It's amazing how the gadgets to help you quilt have improved. When I started I had to make card board templates, trace and cut out blocks with scissors. Hard to believe I got anything finished! Thanks for the give away! I started quilting in the spring of 2010, so just under 2 years ago. I taught myself with online tutorials and some advice from my wonderful LQS. So far, every quilt I've finished has been a gift for someone, so I still don't have any in my house but I'm absolutely loving this new hobby and I know I'll have some to keep soon. I've been quilting since 2002 and took my first class at my LQS. I've been quilting for real since I was in high school - so around 17-18 years! (wow- I feel old now!) my mom taught me. I took my first quilting class at the crafts center in college, but really started in the mid-1990s. Loving all the online opportunities these days! Thanks for the giveaway. I've been quilting for about 15 years, since my mom helped me make my first quilt to take with me to college. I'm an Edmonton quilter and I've been quilting for 11 years! I took one class and learned how to quilt "the right way"; matching seams and all.... But my art really took off when I started to just "Wing It." Most times I make it up as I go along, but my preferred method of learning is from books. I have been quilting for about 12 years and I taught myself. I have read books, but mostly trial and error. This year I finally learned free motion quilting and I am so glad I did. I love it. I have yet to see this book in person, but it looks like it would be fantastic! I would definitly like to own a copy. I have been sewing since I was about 6, and I think I started quilting in my late teens...it all blurs together. I really got more into quilting after my dad's death in 2002. No one really taught me to quilt, it was just something I started doing. I remember my mom was working on a quilt at some point and that kind of sent me in that direction and my aunt is a big time quilter, so she really inspired and influenced me to do more. It was totally my therapy after my dad died, and still is to this day. I first started quilting after watching the movie "How to make an American Quilt" with Wynonna Ryder. And I was just about to get married, and thought how cool it would be to make my hubs and I a quilt. I've been hooked ever since!! Now I'm trying to find other unsuspecting souls to get addiceted to quilting!! haha My sister inlaw just fell prey to me!! Thank you for a chance to win your giveaway. I started quilting in January, of this year (2011). I am addicted and do as much as I can. I used to sew my own clothes in the 80's, so I have sewing skills. 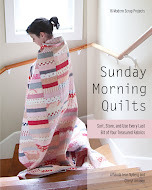 Most of my quilting skills come from the wonderful blogs that I visit. I started my first quilt thirty-five years ago, but it burned in a house fire before it was finished. I didn't quilt again until about five years ago. I love the creativeness of quilting. Thanks for a chance to win this book. I have been quilting for 9 years. I learned because my friends roped me into attending a quilting retreat with them because they wanted to have a girls weekend. I still haven't finished that quilt with fabric from Wal-Mart, but I now love to quilt. I began quilting about 8 years ago when I was 18 and working at a JoAnn's. 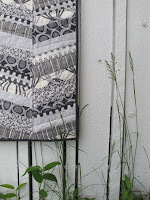 I had been a garment sewer for a few years and one day decided I wanted to learn to quilt. I bought some fabric and a book and made a quilt! It's a very poorly made one but we still use it on the couch so it's definitely served it's purpose! 8 years and almost 40 quilts on, it's cool to look back an see how far I've come! I have been quilting for a couple of years. i taught myself with lots of help from blogs and books. This book looks awesome! thanks for the chance to win. I got the bug to quilt over 10 years ago...maybe closer to 13. However, the first flimsy I made is still a flimsy. Getting married and having kids put the quilting on the back burner. I started again about 1.5 years ago. I am self taught but I remember seeing my Grandma quilt and I have the last quilt she ever made. I started quilting classes with a friend who was a few months pregnant. our first quits were string quilts on a foundation square to teach us some basics. it is one i have done twice since in different sizes. Hi Cheryl, I have been quilting for many years, I think about 20 years. Not every year has a quilt been made...However I am enjoying how productive I am this year. Six quilts and four quilt tops so far (and many WIPs). I have never taken any class (have wanted to) and I have learnt everything I know about quilting from my Mother who is 81 years old and still quilts. I've been quilting for almost a year now, but sewing for 20 years now. You and your quilting are the main reason I started quilting. Thank you for inspiring me. Thanks for the giveaway! This book is already on my Christmas list, but it would be great to win it! Congratulations on your contribution to the book, Cheryl! I am a self/blog-taught quilter. My mother taught me to sew but I always hated sewing clothes. I quilted a baby quilt for my child and discovered a new love! I have been quilting for 4 years now. I would love to have a copy of this book. My Sweetie just started quilting last year and has completed 2 small ones so far. This book would be some nice inspiration for her to make more. About 12 years ago, I really began to get serious about quilting and actually started taking classes! This year, I joined a quilting group and am having a ball! I made my first quilt in 1973 from remnants of clothes I had made throughout my high school years. It was a hodgepodge of colors and the back was a then-modern flowery sheet --now a coveted resale find! And that was it for quilting. Fast forward to 2007 when a good friend invited me to a quilting retreat where she taught me everything I now know about quilting. It was a fantastic weekend of learning and being with wonderful women. Since then I've made quilts for all 12 nieces/nephews, bags, table toppers, buntings. I love quilting! Thanks for the giveaway. I've been quilting for almost 10 years, but these last few years I've gotten a lot more inspiration from the on-line community. 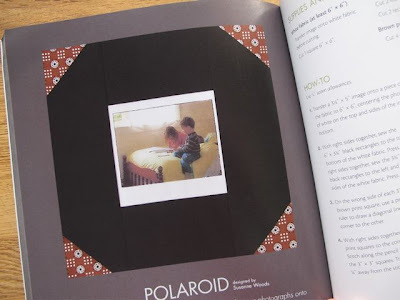 The book looks lovely, I'll have to add it to my X-mas list if I don't win! I've been quilting for about 15 years. Mostly self-taught, with some help from friends when I got to the tricky bits. I've been quilting 4 years...I taught myself during my maternity leave, and I have attended two classes at my lqs since then. this book looks awesome! My mom is a quilter, so I made my first quilt when I was in 4th grade (that was like 20 something years ago :p) I have been quilting on and off since then but have really just gotten back into it! I made my first quilt in my late teens - and there was no "learning" involved at all! I made it all up entirely from seeing a finished quilt. Once. oh, maybe 25 years. My friend helped me cut a gazillion 6 inch strips for a rail fence quilt. She didn't know about rotary cutters or strip piecing. I learned about them quick! I've been quilting since 2003 but sewing for much longer. I learned to quilt by taking a class at my LQS. I had a super teacher and after that I was on my way. I like your block! I made my first quilts in 1992 and I didn't know a thing about quilting. I set quilting aside, then in about 2000 I came back, read every book and magazine I could get my hands on, determined to learn as much as I could. It makes a huge difference knowing some basic techniques. I've been quilting for a little over 2 years, and I learned from a friend. Then we both found quilting blogs, and we learned a lot more together! Congratulations on your inclusion in the book! I started quilting about five years ago...needed a hobby after my youngest was born and I became a SAHM. Learned by doing, and I'm *still* learning! Thanks for the chance to win a terrific book! I've been quilting for six years. My cousin taught me after I moved to a new city. 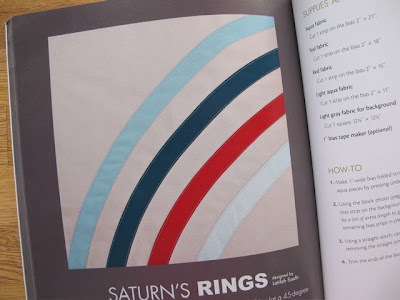 I've been quilting for about 12 years, learning from quilting books, magazines and classes. I've been sewing since I learned in 4-H back in the 60's, lol. Thanks for the chance to win the book. I have been sewing for almost a year and still working on my first quilt! Thanks for the chance to win! I'd have to say I'm still learning to quilt. I started in 2008 (unless you count the quilt-in-a-day I started in 1994 but never finished) and learned mostly by going to my grandma or my friends who quilt when I had questions. I just started my 10th quilt yesterday. I starting quilting 2 years ago, starting with a quilting class I took at the Stitch Lab here in Austin. I fell in love. This book is at the top of my Christmas list. I've been quilting since Jan 2009. I learn from books, blogs, a few classes here and there. Mostly from the internet! 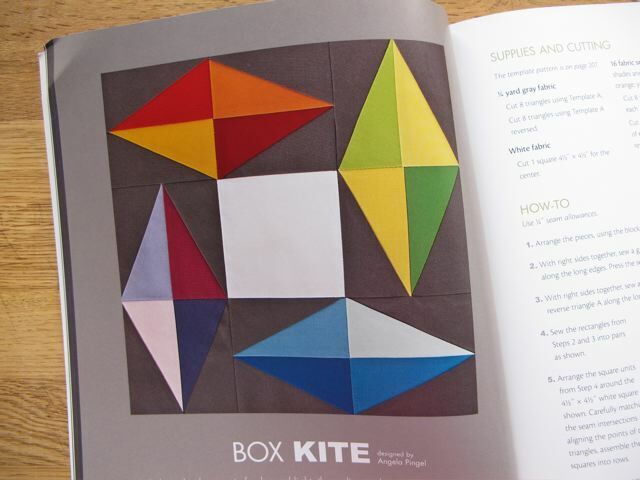 Would love to play with the blocks in thsi book! I learned to quilt in 2003. I wanted to make a wedding gift for my soon to be hubby and decided a quilt was perfect. I finished that quilt and haven't looked back. I think... what on earth did I do with my free time before quilting. It is still priority in my busy life as mom, wife and quilt shop owner. I have been quilting since 2009. When I graduated from OT school, I had a period of about 2 months where I had trouble finding a job. A friend of my now-husband (then boyfriend) offered to teach me how to quilt during my hiatus. I finished my first quilt and, one week later, I landed my first job! Hi there, I've been quilting about 13 years, a lot of garment sewing and crocheting in between too. I love leafing through inspiring books. I have never followed a pattern and just make them up as I go along. Its such a fun pasttime! I started in college when I had to have my wisdom teeth cut out. My mother showed me how to piece. I miss her now.